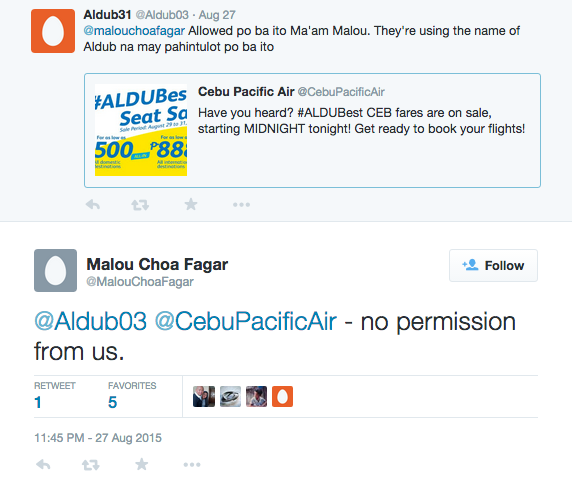 According to TAPE (Television and Production Exponents) Inc.’s Chief Operating Officer, Malou Choa Fagar, Cebu Pacific did not ask permission. 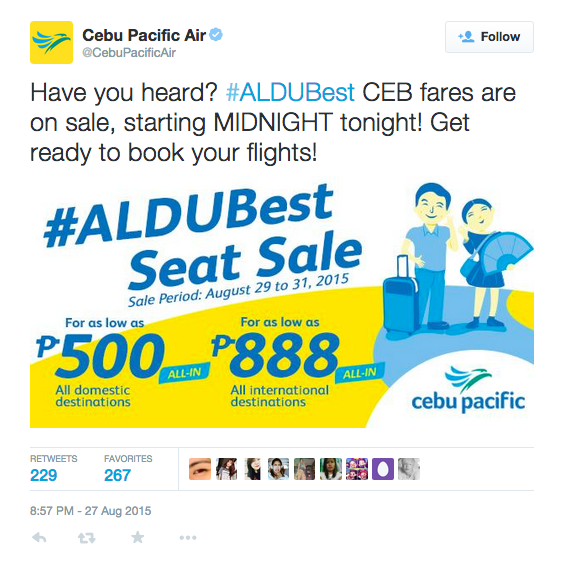 Based on this info, it goes without saying that Cebu Pacific did not pay to use AlDub in the promo. TAPE Inc. is the production company of Eat Bulaga and owns the copyright to the Yaya Dub character and the AlDub storyline. TAPE or its subsidiaries also manages Maine’s showbiz affairs. Tsk tsk Cebu Pacific! Cebupac even used the likeness of Alden and Yaya on the promo graphic, so there is no mistaking what the company is referring to. The use of the #ALDUBest hashtag is effective since the promo easily got the attention of AlDub fans. AlDub fans are very active in social media nowadays. Recent weekday hashtags about the phenomenon easily reach 1 million tweets daily. Tweets on Saturday (when Eat Bulaga hosts special AlDub episodes) have been setting records lately; 2.5 million tweets on August 22 (#ALDUBAgainstALLODDS) and 3.5 million tweets on August 29 (#ALDUBMaiDenHeaven). The 3.5 million is a new Philippine twitter record, beating the 3.3 million #PapalVisit record set during the Pope’s visit to the Philippines in January 2015. 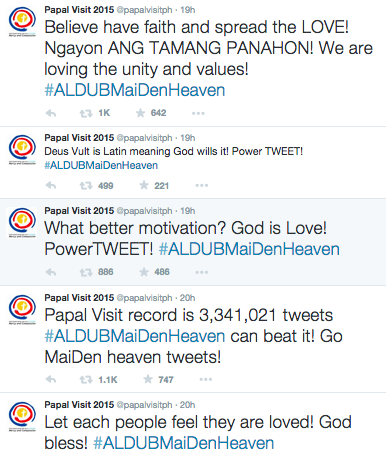 Even the Papal Visit twitter account (@papalvisitph) acknowledged the twitter record set by AlDub fans. In fact, @papalvisitph even tweeted about Aldub and encouraged fans to tweet about AlDub. What was Cebu Pacific thinking? Why didn’t it pay for the privilege of using the AlDub phenomenon for its promo? Smaller companies like La Pacita Biscuits, Hany Chocolate, etc pay for the exposure they get during the AlDub segment. I’m sure Cebu Pacific has a lot more money for ads. Can Cebu Pacific even get away with this? Some fans of AlDub can’t be fooled though. 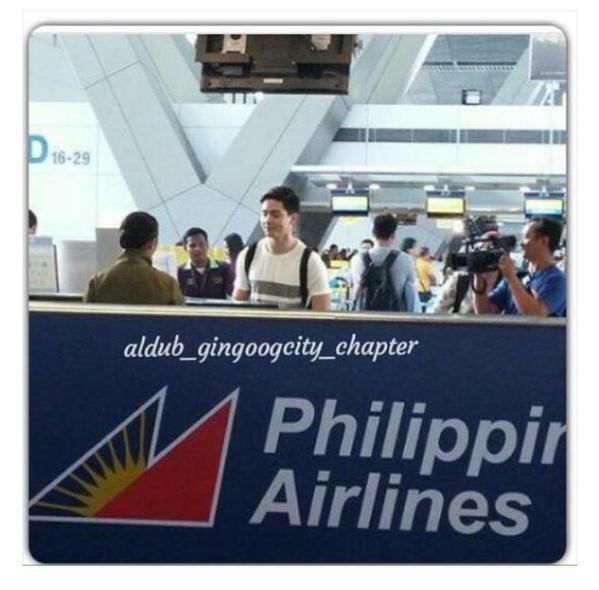 Since many fans are updated on the movements of Alden, they knew that Alden took a different airline in going to Bicol (a region in the Philippines), a trip which was featured prominently in the AlDub storyline. In this particular trip, cameras followed Alden Richards to the airport. He took a Philippine Airlines (PAL) flight. Ha Ha CebuPac! #ALDUBest foiled. Try harder Cebu Pacific… and pay up next time.